As an historian, Sophia found it wonderful that, even in Australia, thousands of miles from the centres of the ancient and medieval worlds she studied, she could get access to primary sources—texts, manuscripts, images, epigraphs—that once scholars had to make pilgrimage to find. On the site I found a record of a grave marker (from Rome) that seemed particularly poignant. She lived 3 years, 3 months, 24 days. 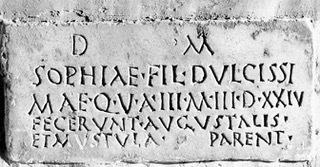 (Grave marker) made by parents Augustalis and Mustula. As our Sophia would remind us, history is full of stories. We just have to open our eyes to see, and to remember.